1401 Back Panel Switch What is the blue switch for behind the 1401 front panel? Arnold does remember that he has installed this switch by himself, but I am not sure: The switch behind the 1401 front console may be a private RPQ: It performes a print operation 2 to a NOP. The use for this was: On repeating for active jobs the printing operations have been supressed. These changings have been documented by Arnold in the ALDs. 1401 Top Right Relay What is the relay for on the top right of the 1401? 1402 AC Feeder This is a power connection cord, you can connect this to 3 phases. 380 V/50 Hz Check the wiring plan as reference. We have a concern that its wire gauge may not be sufficient; certainly when a full-to-nearly-full system is eventually powered (5 to 13 kVA). Our current thought is to search for an "original" 1402 power cord/plug. (We may have such a cord on the 2nd 1402 unit the Museum owns.) The "landing block" for the AC wires apparently also has some cracks. And the 2nd 1402 we have has a manual circuit breaker, whereas there is none in this 1402. 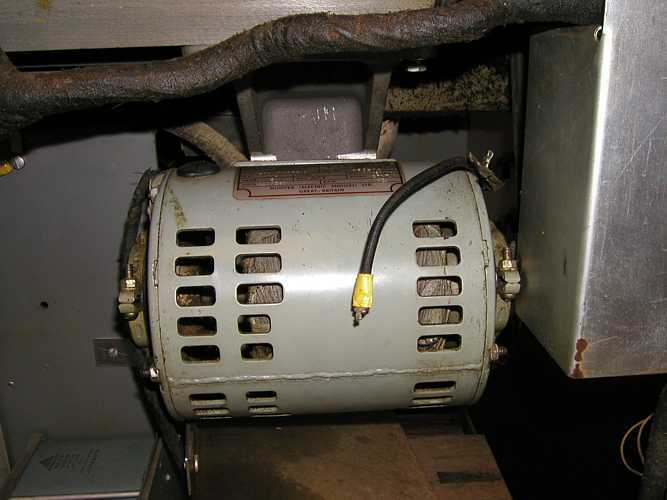 1402 Melted AC Cover What is the story regarding the melted AC transformer cover? This melting is because of normal use, normal heat inside 1402, there was no fire. You can reform it putting onto a heating plate. I'm a little surprised that IBM would design a piece of plastic that normally "melted"! Perhaps the transformer is old and overheating? 1402 Motor Gnd Wire And the motor ground wire handing in space? Do you recall why it was disconnected? 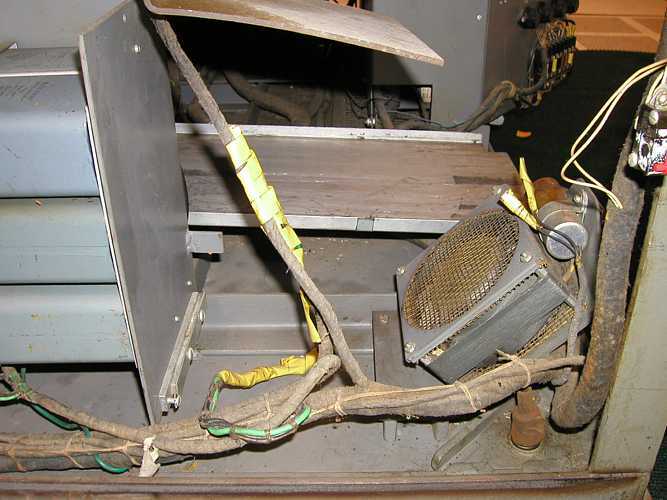 And what was the power fan in the front left of the 1402 cooling? (It looks like whatever it was is missing?). There was no fan when we have received this unit, it worked with out it. 1402 Red Gnd Wire Do you recall "Why the red ground wire?" in this 1402 picture? : Looks to be around the ferro-resonant supply. the so-called "MFI" or "Machine Feature Index" sheet. as the pictures of SMS card bays B1 & B2 below show. Do you recall which special features are in this 1401? Overlap and HW Multiply should have been built in/installed. then you can check if the features are installed. by one of two 1401 systems) is a feature in this 1401? 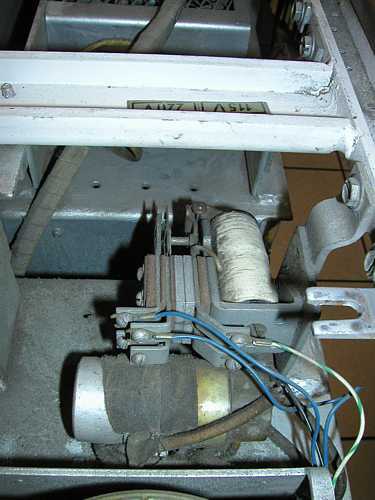 Allen noticed that two of the 729's support tape switching (mod V and II). 3)  Do you know what the switch was used for behind the front console? On repeating for active jobs the printing operations have been supressed. These changings have been documented by Arnold in the ALDs. you can see the status reports. 1402 we have at the museum. We're also working on a plan to apply 50-Hz power to the 1402! 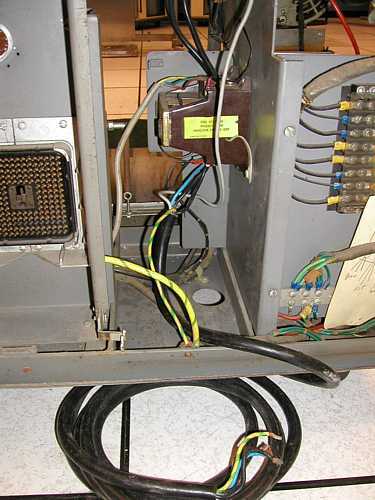 the 1402's AC electrical connections were modified. you can see labeled pictures of the modifications. Can you recall why these alterations to the 1402 & 1401 were made? on the cc line will be in. as Arnold does recall no modifications have been installed. allways with the whole system. We will check the pictures tomorrow and send the comments by mail. certainly appears to be a modification from original. What is the story regarding the melted AC transformer cover? And the motor ground wire handing in space? cooling? (It looks like whatever it was is missing?). > were connected to 380 Volt, 3 phases, 50 hz, running was no problem. > allways with the whole system. > We will check the pictures tomorrow and send the comments by mail. > >> This is a power connection cord, you can connect this to 3 phases. 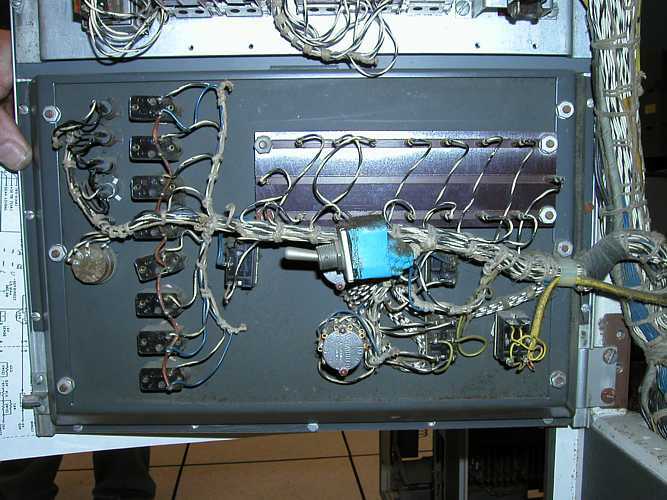 > Check the wiring plan as reference. when a full-to-nearly-full system is eventually powered (5 to 13 kVA). Our current thought is to search for an "original" 1402 power cord/plug. The "landing block" for the AC wires apparently also has some cracks. there is none in this 1402. > And the motor ground wire handing in space? > cooling? (It looks like whatever it was is missing?). We're wondering "What did it cool?" 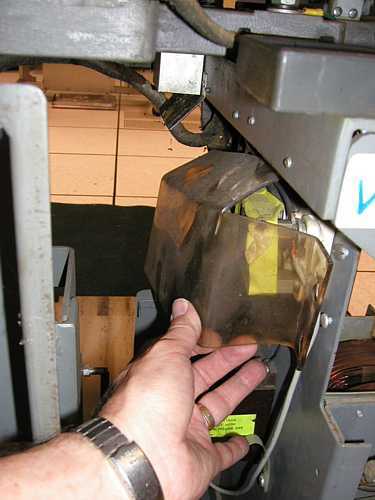 > What is the story regarding the melted AC transformer cover? > there was no fire. > You can reform it putting onto a heating plate. Looks to be around the ferro-resonant supply. What is the blue switch for behind the 1401 front panel? What is the relay for on the top right of the 1401? p.s. 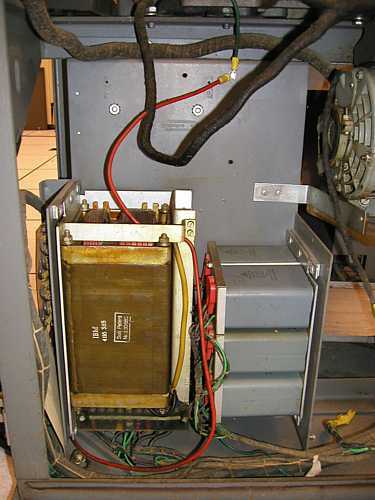 We'll be checking the 380-VAC wiring with a 500V "Megger", etc. > certainly appears to be a modification from original. > You can reform it putting onto a heating plat.